Among the various reforms which have been offered to the world, the projects for universal peace have done the greatest honor to the hearts, though they seem to have done very little for the heads of their authors. Rousseau, the most distinguished of these philanthropists, has recommended a confederation of sovereigns, under a council of deputies, for the double purpose of arbitrating external controversies among nations, and of guaranteeing their respective governments against internal revolutions. He was aware, neither of the impossibility of executing his pacific plan among governments which feel so many allurements to war, nor, what is more extraordinary, of the tendency of his plan to perpetuate arbitrary power wherever it existed; and, by extinguishing the hope of one day seeing an end of oppression, to cut off the only source of consolation remaining to the oppressed. A universal and perpetual peace, it is to be feared, is in the catalogue of events, which will never exist but in the imagination of the visionary philosophers, or in the breasts of benevolent enthusiasts. It is still however true, that war contains so much folly, as well as wickedness, that much is to be hoped from the progress of reason and if any thing is to be hoped, every thing ought to be tried. Wars may be divided into two classes; one flowing from the mere will of the government, the other according with the will of society itself. Those of the first class can no otherwise be prevented than by such a reformation of the government, as may identify its will with the will of the society. The project of Rousseau, was, consequently, as preposterous as it was impotent. Instead of being with an external application, and even precluding internal remedies, he ought to have commenced with, and chiefly relied on the latter prescription. He should have said, whilst war is to depend on those whose ambition, whose revenge, whose avidity, or whose caprice may contradict the sentiment of the community, and yet be uncontrouled by it; whilst war is to be declared by those who are to spend the public money, not by those who are to pay it; by those who are to direct the public forces, not by those who are to support them; by those whose power is to be raised, not by those whose chains may be riveted the disease must continue to be hereditary like the government of which it is the offspring. As the first step towards a cure, the government itself must be regenerated. Its will must be made subordinate to, or rather the same with, the will of the community. Had Rousseau lived to see the constitutions of the United States and of France, his judgement might have escaped the censure to which his project has exposed it. 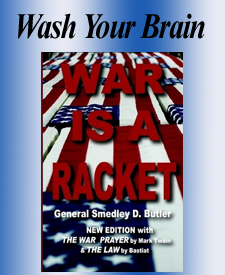 The other class of wars, corresponding with the public will, are less susceptible of remedy. There are antidotes, nevertheless, which may not be without their efficacy. As wars of the first class were to be prevented by subjecting the will of the government to the will of the society, those of the second, can only be controuled by subjecting the will of the society to the reason of the society; by establishing permanent and constitutional maxims of conduct, which may prevail over occasional impressions, and inconsiderate pursuits. Here our republican philosopher might have proposed as a model to lawgivers, that war should not only be declared by the authority of the people, whose toils and treasures are to support its burdens, instead of the government which is to reap its fruits: but each generation should be made to bear the burden of its own wars, instead of carrying them on, at the expence of other generations. And to give the fullest energy to this plan, he might have added, that each generation should not only bear its own burdens, but that the taxes composing them should include a due proportion of such as by their direct operation keep the people awake, along with those, which being wrapped up in other payments, may leave them asleep to the misapplications of their money. To the objection, if started, that where the benefits of war descend to succeeding generations, the burdens ought also to descend, he might have answered; that the exceptions could not be easily made; that, if attempted, they must be made by one only of the parties interested; that in the alternative of sacrificing exeptions to general rules, or of converting exceptions into general rules, the former is the lesser evil; that the expense of necessary wars, will never exceed the resources of an entire generation; that, in fine, the objection vanishes before the fact, that in every nation which has drawn on posterity for the support of its wars, the accumulated interest of its perpetual debts, has soon become more than a sufficient principal, for all its exigencies. Were a nation to impose such restraints on itself, avarice would be sure to calculate the experiences of ambition; in the equal poise of these passions, reason would be free to decide for the public good; and an ample reward would accrue to the state. First, from the avoidance of all its wars of folly, secondly, from the vigors of its unwanted resources for wars of necessity and defence. Were all nations to follow the example, the reward would be doubled to each; and the temple of Janus might be shut, never to be opened more. Had Rousseau lived to see the rapid progress of reason and reformation which the present day exhibits, the philanthropy which dictated his project would find a rich enjoyment in the scene before him: And after tracing the past frequency of wars to a will in the government independent of the will of the people; to the practice by each generation of taxing the principal of its debts on future generations; and to the facility with which each generation is educated into assumptions of the interest, by the deceptive species of taxes which pay it; he would contemplate, in a reform of every government subjecting its will to that of the people, in a subjection of each generation to the payments of its own debts, and in a substitution of a more palpable, in place of an imperceptible mode of paying them, the only hope of UNIVERSAL AND PERPETUAL PEACE.